In general, I don’t particularly like games that feature some narrative theme painted over an unrelated mechanical base. Robert Abbott wrote once about how animating Chess, by say making the knights come alive and charge into the peasant pawns, can’t be called an improvement. I agree with this, but despite my prejudice, it’s hard not to be charmed by Wizorb, the 2011 debut project from Tribute Games. It’s just Breakout, but it has a cute 8-bit RPG veneer on top. It’s clear no one sat down and thought, “How can we best mechanically represent the awesome power of being a wizard? Maybe pong?” Nope- it’s clear the pitch here began and ended at “So, it’s Breakout, but with a cute 8-bit veneer on top.” And while as an idea that’s not inspired, and neither is the execution, it’s still a diverting experience for a short time. The production value is really quite high- the animations, the menus, the cinematics, etc etc, are all lovingly done in a convincing retro style. It’s also not using the increasingly common faux-pixelated style, wherein it looks pixelart-esque, but employs lots of modern shading and animation tricks. No, this is believable as a NES game, or as an arcade cabinet from the early 90s (though not exactly, since it probably uses too many colors or whatever). I feel the retro style is being used here to good effect- it gives a fun and oldschool feel to the game, which is appropriate, since the core mechanic of Breakout is almost 40 years old. But does the narrative veneer here improve the underlying game? I actually think it does, though it doesn’t go far enough. Breakout is fine as an abstract game- you have a paddle, you move it about, and hit blocks. It’s the game of trajectories! With Wizorb though, the standard paddle is replaced with your magic wand, as the protagonist Cyrus is presumably a graduate from one of the lamer schools of magic. The blocks are replaced with 8-bit crates, bushes, enemies, etc. The power-ups mostly feel natural as well; you build up magic which you can use on a fireball spell to destroy one block, make the ball go through obstacles, etc. You can also spend magic on some sort of whirlwind spell which alters the ball’s speed and trajectory, but it was too finicky to use well so I never did. There are also cute power-downs, like a blob of evil goo (what.) that slows your paddle down, and you get rid of it by shaking the paddle back and forth- that’s delightful design. A cute RPG town, but to what end? The RPG elements feel a little tacked on at times though. During stages you can collect coins, which you can spend in bonus level shops to buy upgrades like increasing the size of your magic wand (which is an awkward a phrase to type as I’m sure it is to read), or buying extra lives. These elements don’t quite hit home for me, but they’re not bothersome. 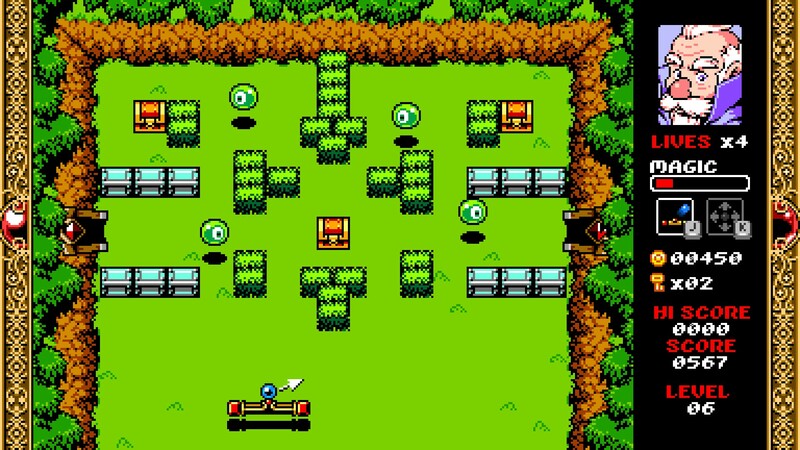 The method of accessing bonus stages though- via hard to reach doors with bonus keys you collect- feels like a nice marriage between Breakout and the RPG setting. There’s also a home town that you can repair/upgrade, though I’m not sure what the benefit of doing so is. It’s surprising there aren’t more RPG features- I expected to level up my wizard guy for powers, like different spells, faster paddles, the ability to see a dotted line projecting where the ball goes (the skill would presumably be called “Wizard eyes”), I don’t know, something. What’s the point of affecting an RPG art style if you’re not going to use RPG game elements? There’s also an extremely thin story as well, which feels like another missed opportunity- why add narrative trappings and characters if you’re not going to use them? 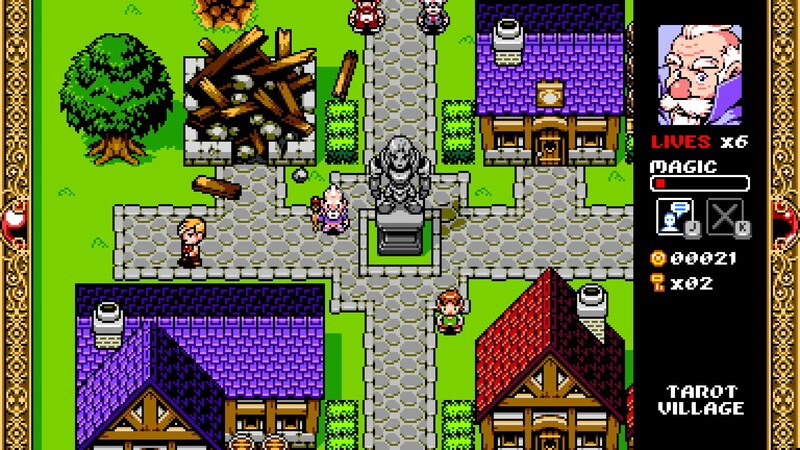 Even if underused, the RPG elements are charming. However, it doesn’t stop the core mechanic from feeling stale. I mean, it’s just Breakout, with no surprises: you hit a ball with the paddle to destroy blocks. Beyond the aesthetic changes, there’s remarkably little innovation going on here, just the usual fare- the paddle can be slower or faster, longer or shorter, the ball can get faster, and presumably there’s a multiball power somewhere, because there’s always a multiball power. As a result, to me it felt incredibly tedious. A given area has 13 levels, and I struggled to get through them just because the underlying game is just such an old hat. An old hat, with the same unrepaired holes: a game of Breakout starts out fun and chaotic, but getting the last few blocks is always time consuming and not particularily fun. That’s on full display here- level after similar level, waiting to hit that damned last crate. There is some innovation going on here though- the boss fights in particular are breath of fresh air to the well-worn premise, and are executed well. But those moments are few and far between, and the interim is just too boring to trudge through. I feel bad ragging on Wizorb so. It’s an indie game and was very clearly made with love. The art direction and music are great, and the theme is more or less consistently executed throughout. But that doesn’t stop it from being just an RPG gloss on a stale game, and it’s a shame more thought wasn’t devoted to either the gloss or the game.